El océano Pacifico se salía del mapa! desordenado y azul que no cabía en ninguna parte. Por eso lo dejaron frente a mí ventana. The Pacific ocean left the map! disorderly and blue that it wouldn´t stay in any part. Therefore they left it outside my window. We spent the weekend in Valparaíso - M, another place I am sure you would love: a disorderly, dishevelled port town (a robbing for free was included, unfortunately). With old rickety lifts going up the hillside - there was a bit gentrification going on there, alongside some proper social struggles over their public spaces, graffiti and fantastic views of houses, electricity cables and beyond all: the Pacific in all its disorderly beauty. Next: Ruta 5 Al Norte (aka The Panamericana). ... it's Friday morning and here I am. Or am I not? This looks wrong, doesn't it? Too much rain, too much low clouds, too much Scotland. For the first time I'll take my postcards with me - can you see them? White paper, beautiful handmade white Khadi paper, 300gsm, NOT, torn to postcard size. I had been thinking of doing this before: take paper, make postcards, put in envelopes and off they go. This time, I'm well prepared. Only need to pick up some envelopes, perhaps en route in Madrid tomorrow evening? Among my travel wishes was this bit of poetry. M., I hope you don't mind me sharing? It's explicit - pretty much so... I like the image of shoes as boats floating on the water - filled with emptiness and journeys. I am sure my gran would have marvelled at it too. Thank you, my dear! of two things, emptiness and journeys. but what chapters of me are curled up in them? and emptinesses to be suffered. Now, it's a toss up between Chatwin or another one that is lingering on my window sill. Different continent, but as I'm currently compiling a list of must see places, Namibia (or thereabouts) figures highly and Uwe Timm's Morenga has been luring me for a while. Well... I can sleep once more over it. Now... there'll be postcards... hopefully, just wait and see. ... no, not to wrap yesterday's cheese, but yesterday's monotype experiments. Well, for all the time we were there it did not stop raining. Now, RAIN was a bit too strong a word, more a persistent drizzle and the paper put up some brave resistance. The sketching went well, preparing the acrylics with some Lascaux extreme retarder (love the title) worked well too - it remained workable for about 20mins or so, and the copper plates are nice and solid to work as plate. But, the moment it all came tumbling down, or rather: blowing up in my face was when I tried to pull the print: too much wind blowing in my face, into the sketchbook and the assorted paper mess with which I tried to keep my hands, clothes, bags etc reasonably clean. Ok: lesson learned: minimise on paper setup in gusty gales; acrylics mixed with retarder also means: it can leave marks on your favourite clothing a lot longer than normal. LOL. But, these still made all of it worthwhile, don't you think so? Two cool moody made with dreich and Scottish wind on a March Sunday afternoon monotypes. It's the corner of the Loch where the river opens up into it, it has some beautiful bares trees standing in water, some rather adventurous waves came rolling in and a firm breeze in your face. It's a great spot - I'm not sure if H. fully appreciated it, but I did! It's very moody with low clouds over the distant hills; the phtalo blue was a good choice (despite the stains it left everywhere); and the acrylics/medium is good enough to work with - it'll go into my Chile bag; not sure how it will perform under heat, but I will find out. I'll be off to Balloch again soon, with H. to do some more sketching, and trying out monoprinting on the river shores. In good style, Scottish weather is having a Scotland day: dreich, the odd shower, but not to worry: by now I know the best coffee spot in Balloch. And there I was: with two out of four favourite albums for holiday car trips with R. - I need to remind her to bring her driving license when she'll meet me in Santiago in just over a week's time. I had also splashed out on a couple of more pastel sticks... three in fact. One a trusted favourite mid-value grey purple, then a red earth which is possibly rather close to the one that Casey uses in his Hoquiam River Series, and something rather strange: Unison's Blue Violet 3, phew... candystick pastel colour. Gosh - my thinking: clear skies make everything sparkle, how about a bit of light violet among the sparkles. Na, let's wait and see if it that will work. In any case: I opened my Chile sketchbook. With a very unambitious first page pastel scumble colour test. I really don't like the first new page anticipation anxiety. So, this is decidedly and exquisitly ignoring that pressure. It'll be good pages only from now on. I'm curious to see what palette I will eventually end up with. ... that's the forecast for Santiago de Chile, for tomorrow, the day after and the day after that. How do I know? I've been checking it out frequently. Why do I care? Because I will be there as of next Friday onwards. In fact - the forecast for Antofagasta in the North of Chile has been greeting me for past few days with incessant sunshine. And the best of it all: I will be there at the next full moon. 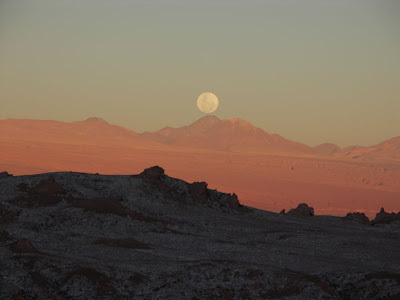 In San Pedro de Atacama. The Atacama desert and the Pacific ocean, the Pacific ocean and the Atacama desert. A full moon and one of the clearest skies on earth. For three weeks. Did I say where I will be going? I've made some plans on painting/sketching material - and one of the things I'm seriously considering is taking a small plate along and some ink for monotypes. Have you ever taken printmaking material on plein air outings? If so, what type of printmaking and where? I'm very intrigued by this - in fact, I may give it a try on my next trip to Balloch on Sunday with H. - that should give me a sense of practicality before lugging it halfway around the world. Now - there was a plan to brush up my Spanish - that has for one reason or another not materialised. But, I had been doing a bit of digging around Chilenean poetry - there is Pablo Neruda of course. I also came across Gabriela Mistral. A mystical and rather romantic earthieness and invocation of nature... How's this for a start? y la gloria de los huertos. a unos quioscos del infierno. a otros dos que no cogieron. de niebla que me nacieron. sin virtud doy o cedo. fruto que tomo y entrego? ... the monotype gave me what I was after for a sense of different layers for a reductive lino cut. But as you can see: the marks are all a bit too squashy. I had already taken some of the excess paint off with a bit of blotting paper, had to rub quite extensively to transfer most of the ink onto the actual print, but it's a bit homogenous in terms of markmaking. Nonetheless: I find using oil paints for this very worthwhile by being able to use actual pigments - again, the cadmiums are doing their work. I've now started with the next linocut: I'm cutting a 20x25cm vinyl plate, and the first colour is a [paleish] ultramarine. I thought an edition of 10 maybe acceptable, but now have the washing lines across my flat stuffed with drying sheets - I'm using the Tosa Shi, another thinner Japanese paper and very smooth printing paper - it's interesting to see how different they respond to the ink. Du weisst schon, dass ich ganz, ganz froh bin ueber das, was du heute gemacht hast, ne?? So oder so gehoert da viel Mut zu; und auch wenn's erstmal etwas unbefriedigend ist, gibt's vielleicht noch ne Moeglichkeit zum Nachtreten. sie koennte auch locker unsere Tochter sein. Bisschen Annett Sonstwie mit dem Spielen, ne? Last week's misshapen pastel sketches on printmaking paper did offer up a few insights into the next relief cut. But before I want to proceed to that, I thought I'd try again some more monotypes. I was keen on trying them out on a larger scale than the previous 20x15cm. So, with all the courage I could muster this morning, I inked up an A3 sheet of acrylic paper - I had assumed that its preparation for acrylics would have prevented the oil paint I am using for printmaking to sink in, well - nice idea; in practice, though, the paint sunk in rather quickly; and for the next prints I just used one of the large laminated boards floating about in the studio - that worked perfect and provided a large enough surface to fill. I started with monochromatic: the remainder of my tube of burnt umber was mixed with a bit of stand oil and turps and pasted onto the board; I then proceeded with various rounds of markmaking (knives, tissue paper, etc), adding and removing ink as I went along. Printed one, then another and another. I've been doing a bit of systematic exploration of different papers, there's some I've been using a fair bit by now, but there was a new, very smooth, sized printmaking paper in brilliant white on the go today, (interim verdict: I LIKE IT); the trustworthy Tosa Shi (but too few sheets of it). I like these sparse monotypes a lot, and on the larger scale they are fascinating: so extensive and yet very reasonable (!). In reverse, I am also reconciled with the composition - last week I initially thought it was weak, but no, it isn't. I moved to another one in colour. But that's next post. By the way, if you want to have a look at a larger size of the image, click on it, the click on 'All sizes' on the flickr image, this takes you to the full resolution. I have been going back to my copy of Wolf Kahn's Pastels rather frequently, soaking up some of the markmaking and palette choices of his. I was intrigued to read more about his approach to landscape as a subject - it resonated on a number of levels, some of which I mentioned before briefly. 1. Landscapes as creating space (I am tempted to talk about the production of space, but then I'm firmly in academic jargon, so I leave that for a moment). Kahn's work is very subtly positioned, perhaps through part of what he calls 'strategies', midway between the demands of nature and those of art. 2. Sensitivity to mood, climate, light and place - I called that romantic love of nature landscapism before. ... clues to what [Kahn] is after in his own work: stillness, what he calls 'radiance', and a coloristic experience that, as he says 'ups the ante'. Place becomes meaningful for him when returns to it again and again, to 'deepen the experience'. Here, soft pastel provides a medium with which to record immediate experience and ability to rely on process - to be worked up later in a more formal process with oil paints. The medium enables Kahn to grapple at once with the subject of nature and its pictorial solution. Oh, and then I had an image of myself staring back at me in a weird place on the sidebar, having momentarily forgotten that I had sent it to Casey at Pastel for a guest spot. So, Casey will host a post about my fields, ponds and various reflections shortly, but has announced it yesterday. I am very excited about this - Casey's own work as well as his discussion of Kahn and other Colorists has been hughely important for me to get a sense of the possibilities of pastels. ... ok, here's the promised crit & comment bit on Saturday's studies of THE field. This should have been ready earlier in the evening but some simple editing tasks currently take ages. I even had a Photoshop Elements in my shopping trolley inbetween. I am intending to be good-willed and patient with my new open source image editing software. After a while of this, I now have something that highlights the problems in the study. It was study no 2, it followed the one I posted on Sunday. Again: the task was drawing marks and a different palette. The scene originates with last summer's sketches and I did some more in December. I am therefore back with the fields again; searching for a subject for a reductive lino print. But before that, I tackled some highly unsuitable paper with my Terrage sticks - it's a Japanese paper, fairly thin and with a kind of felted surface - consequently: crisp marks kept evading me and it dissolved rather quickly - as the second circle from the bottom shows. The composition looked wrong to me, but after a while I realise that it's a bit more subtle than that: the top circle shows too much contrast between sky and forest in the background; and the salmon in the second from top circle folds the space of the field against the forest in a funny way. In many ways I love that effect: how hues make space, bend it, twist it and confuse the onlooker. I like the salmon colour a lot since I discovered it, but it doesn't work in that field. 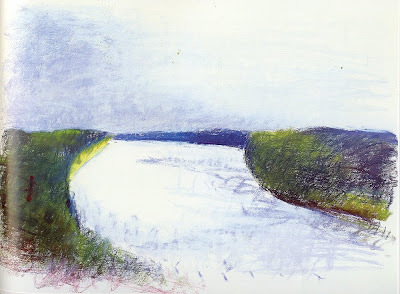 So, for a pastel drawing study, the marks are intriguing but some of the hues are not worked out in relation to each other - I think the violet blue in the foreground is wrong too. And, while I cannot as of yet put my finger on it, I think it got me further for a reduction linocut. There's something in the layering of different hues here - and perhaps the solidity the drawing is struggling with in the background, which could work well in print. Good... more on that to follow. ... with this post eventually. But first off a few thoughts on group dynamics (again). I mentioned a few times before how my Saturday group has been changing from the exhibition last June onwards. This term, it is even more different. The group runs as an adult education class, so people register for it - and for the past few years, the group always consisted of about 8 people who had gone for a long time and about 4 new people who would change from term to term. Not so this term: it's pretty much the other way round and it's intriguing to see how that changed the dynamics from an open group very much into something much more structured and tutored. We would turn up some time after 10 am and usually Tom, Irene and myself are the last to leave at about half one. I tended to be one of the early ones there, just at the back of ten. Yesterday I turned up at 10.08 am and I was the last one. That has consequences: the room is generally cramped; with poor lighting, there are about four places close to the windows and the sinks - I would always try to get easy access to the sinks because of the water-based, frequent handwashing mix-fest that much of my work is. But: there has never been a space close to the window. Bummer. So, it's somewhere in the middle of the room, taking up some of the flexible and improvised corridors that form throughout the morning. So, in the middle of the room, it was busy - so many people, so many projects, so much busieness. I could feel myself getting all worked up within five minutes. Oh dear, - it often takes me some time beforehand to figure out what I'd like to do. And it was all clear: I wanted to do pastel drawings of some new scenes. But instead I was quickly developing hectic spots all over my face, crunching up my forehead and breathing far too fast. And then I remembered: I packed up my sketchbooks, took my box of pastels and some pens and left. Went out to the corridor with a great view across the West end and sat on the floor. So: their projects aren't mine, their worries over how to mix that paint weren't mine, either; instead I wrote pages upon pages with the ideas kicking around in my head. Very good ideas, but they need to get out of my head. So, they went onto paper. But where do they go? I've begun to use an A4 wire-bound sketchbook to record ideas, work out prices, and collect stuff. - All done verbally, in text. To move my writing into something more visual. Work out my ideas more in sketch/drawing/visual form. I want a smooth, perferably Hot Press, relatively heavy paper - for dry media but the occasionally oil/gouache/acrylics; it needs to lie flat when open (but hardbound so that I can easily work across the pages) and it needs to be LARGE. In addition, I want a smaller one [A4 or square? ], wire-bound with similar paper to carry with me - for bigger sketches and experiments when outside. People also mentioned cutting, redrawing or pasting work from the portable sketchbooks into the main one. Sounds good to me. Will try that. I think I will order a couple of books from Green and Stone, and try them out. As for the painting class, I eventually did some pastel skecthes, as you can see at the start of this post There's a crit & comment to follow soon, along with some further ideas for where this may go. ... are also so exciting. So, if we stick with my new sketching location, take a look at its possibilities: an undulating river, moored boats in various states of decay, sandy shores, grassy shores, trees with exposed roots, little waves, bigger waves, hills in the distance, mist in the distance, ducks, swans, the air filled with the sound of gulls and the faint smell of the sea. And, to keep my tree intrigue in motion: look at the birch trees against a winter sky. I need to go again, rather urgently, I feel. The last two times I was there with other people - the first visit worked well with time for sketching - and me asking for that time; the second one was a bit more difficult: too much movement, someone I didn't know well enough, and some confusions over the purpose of a weekend (mine: doing art and having fun; his: working). ... are so difficult. Even if it's only one week, the last entry seems so long ago. And some video observation of small, friendly waves as they are criss-crossing the boat's path. That'll be enough for another start, don't you think so?